We offer specialized training in the impact of early trauma and provide healing interventions. We will translate research and theory into practical interventions. Parents and professionals need more than just vague theories. Please view our books and see the proactive plans available for healing relationship avoidant children. Come join our support group to learn the skills necessary to maintain a therapeutic home environment designed to heal the hearts and minds of children and teens affected by early trauma. Thank you for your interest in learning about the special needs of children with complex trauma. Such trauma can occur from abuse, neglect, abandonment, and even from emotionally distant primary caregivers. We offer specialized training in the impact of early trauma and provide healing interventions. We will translate research and theory into practical interventions. We make attachment and trauma research practical. or we offer customized training to meet your needs! Because millions of children experience early trauma and attachment disruptions, whether through death, physical or sexual abuse, domestic, community, or school violence, terrorism or other tragic losses, parents and professionals need not just vague theories but a proactive plan for healing relationship avoidant children. Authors Hall, Merkert and Biever have successfully merged mental health, trauma, and attachment, parenting and in-home treatment strategies into a single comprehensive resource for parents and professionals. The authors emphasize the importance of an in-home plan (where the healing must begin), outline how to effectively assemble a support network, provide the keys to the establishment of a therapeutic home environment, discuss psycho-education that identifies the six distinct Trauma Disrupted Competencies and provide multiple types of healing interventions. 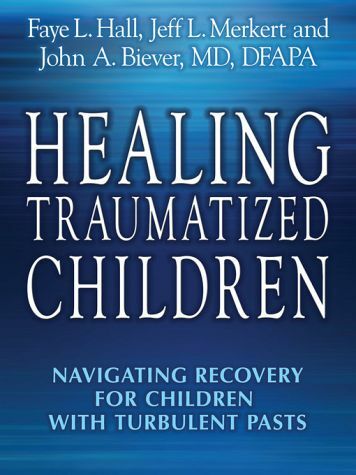 Healing Traumatized Children confirms that without effective in-home intervention, many of these children will become involved in juvenile and adult justice systems and continue the intergenerational transmission of maladaptive relationships, abuse, and neglect. It is important to remember that these children will eventually become tomorrow’s parents. One bright and sunny morning, a tiny baby was born. The loving mommy looked into her baby’s eyes and smiled, and promised to take care of her every need. As all babies, this tiny child learned about herself from her mommy’s eyes, loving smiles, and tender touch, each coming straight from mommy’s heart. This mommy knew she could take good care of her baby and keep her safe from others who may hurt her. This mommy could see a bright future for herself and her baby. Everyday, this tiny baby needed mommy’s love and care. With fright from noises-the baby feared danger. Each time her mommy came, mommy shared the fear and helped the fear go away. This tiny child learned from her mommy’s eyes, loving smiles, and tender touch that she was precious, mommy could be trusted, and she was safe. One bright and sunny morning, a tiny baby was born. The mommy looked into her baby’s eyes and promised to take care of her every need. As all babies, this tiny child learned about herself through her mommy’s eyes and touch, each coming straight from the heart. But, this mommy’s heart was hurt. Sometimes, she could not take good care of her baby. Sometimes, she did not stop others from hurting her baby. This mommy could not see a bright future for herself or her baby. Everyday, this tiny baby needed mommy’s love and care. With fright from noises, the baby feared danger. This tiny child learned from her mommy’s hurt heart. Mommy did not always come to help baby. At times, mommy’s hurt heart kept her from being gentle with baby. Baby became more afraid-even afraid of mommy. Sometimes, strangers came and made baby more afraid. Baby’s fear seemed to grow and grow. Meeting on the first Tuesday evenings of each month, this support group focuses on teaching and reviewing parenting skills necessary to maintain a therapeutic home environment designed to heal the hearts and minds of children and teens affected by early trauma.